Yesterday was a good day for baking, but not so much for photo taking. It was basically black outside and pouring rain at 3:00. My Chocolate Cream Puffs with Mascarpone Filling were not shown off in their best light (and let’s not even get started about my weird hand). I have to take the bad with the good, I guess. 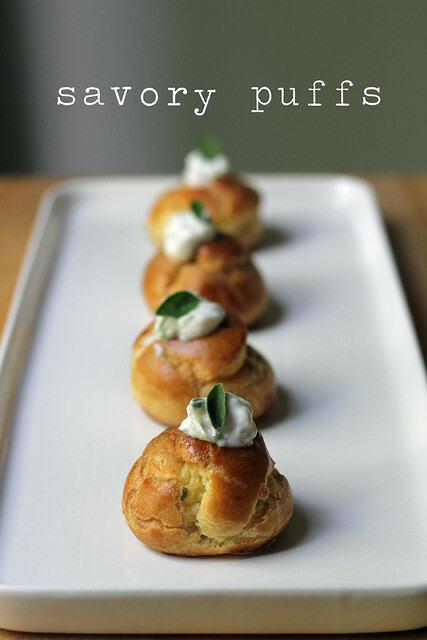 I do love making pastries with choux paste– it’s such a fun dough to make! And turning regular cream puff dough into chocolate cream puff dough is as simple as adding a little cocoa to the mix. 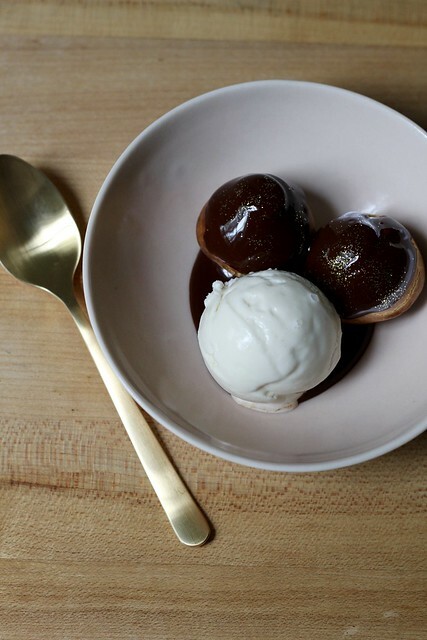 Dorie suggests filling these light chocolate puffs with a rose-scented mascarpone whipped cream. I saw the words “chocolate” and “mascarpone” and could only think “tiramisu” (isn’t that so predictable?) so I skipped the rose and added coffee extract to my filling instead. 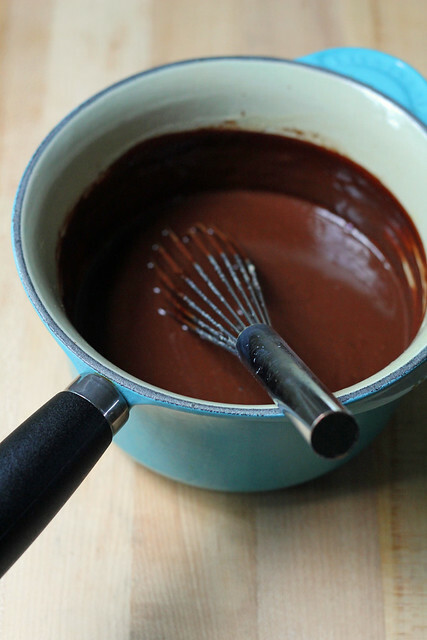 I made a quickie ganache glaze to dip the tops into and tacked on chocolate sprinkly bits. Delightful. As an aside, I think the tastiest and best way to stabilize whipped cream is to add in a blob of mascarpone and I actually do this often. It lasts for a few days if you want to whip extra, and if you need to frost a cake with whipped cream, this is the way to go. I tucked half of these puffs, sans cream filling, into the freezer so I can turn them into one of my very favorite other choux desserts, ice cream profiteroles, later in the week. For the recipe, see Baking Chez Moi by Dorie Greenspan (it’s also here). Don’t forget to check out the rest of the TWD Blogroll! In case you can’t tell from the over four hundred posts I’ve written, dedicated to the over four hundred recipes I’ve made from her books, Dorie Greenspan is one of my favorite cookbook authors. Anytime she comes out with a new title, I can’t wait to dive in, and of course that’s the case with her beautiful brand-new Everyday Dorie! I have at least two dozen recipes I need to get down to business with soon, but I’m beginning with what she calls “My Newest Gougères,” and I’m making them along with the Cook the Book Fridays group. They’re starting today to cook their way though Everyday Dorie, and I’ll join in as often as I can. Gougères are made with choux paste, one of my favorite things to make. This newest version is a cheese puff not only loaded with cheese (of course), but also chopped nuts and a bit of Dijon mustard. You can play around with the cheese and nuts. I went pretty classic with a Gruyère and walnut combo. These make a great salty, cheesy snack to have with a glass of rosè. The nuts give them more substance than other gougères I’ve made. I have some more in the freezer and I think they’ll go really nicely with a bowl of tomato soup, too. 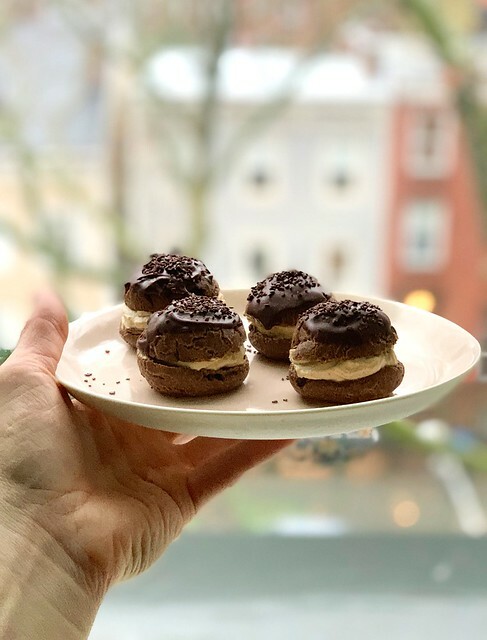 For the recipe, see Everyday Dorie by Dorie Greenspan (you can even watch her make them in this video), and head over to Cook the Book Fridays to see how the group kicks this one off! This major sweet tooth has a hard time picking out an absolute favorite dessert, but ice cream profiteroles are definitely on the shortlist. In fact, I get a little angry if I go to a French bistro-style restaurant and they aren’t on the menu! Choux is fun to make at home though, so I’m happy to take care of my profiterole cravings myself every once in a while. These Profiteroles, Ice Cream and Hot Chocolate Sauce have an extra twist…the choux puffs are actually filled with pastry cream. Cream puffs and profiteroles in one– a twofer! That’s more than I need, really, but I’d never say no. I had choux piped out in the freezer, I made the chocolate sauce ahead of time and I used shop-bought ice cream, so making a little pastry cream was no big deal. This was a great dessert, of course, and I’m glad I got a chance to make it. For the recipe, see Baking Chez Moi by Dorie Greenspan. Don’t forget to check out the rest of the TWD Blogroll to see what other folks caught up on this week! Normally when I think beignet, I just think donut…well, French donut, I guess. Something made with a donut-like dough. Usually involving yeast. 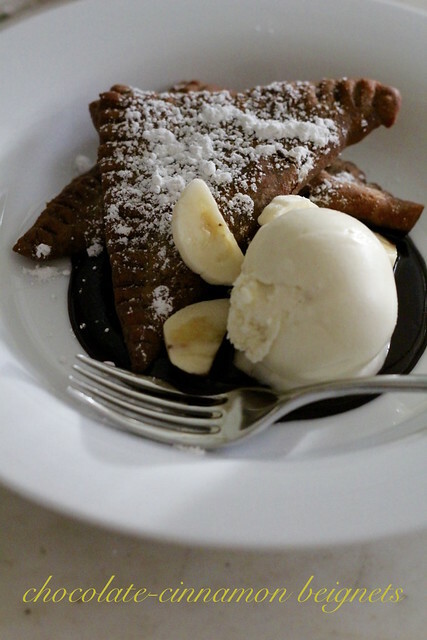 It turns out there’s another type of beignet that I wasn’t really aware of…one made with fried pâte à choux dough, and Norman Love’s Chocolate-Cinnamon Beignets are an example. These ones have cocoa and cinnamon flavoring the choux dough and a filling of caramelized banana pastry cream. Yeah, there are a a bunch of things to make, but mmmmm. Assembling these beignets is a lot like forming dumplings or ravioli. The choux dough is wrapped and chilled, before being rolled, cut and filled. And then folded, crimped, frozen and fried. I’ve never rolled out choux dough before, so this was a fun exercise. I could have cut the dough into circles like in the recipe (and made half-moons), but I cut it into squares instead (and made triangles) so I wouldn’t have any scraps to waste or otherwise deal with. Different geometry, but it all tastes the same. These are best served à la minute, right when they’re fried crisp and the filling is warm. The recipe calls for serving the beignets with a sweet walnut and cream sauce, which I’m sure is delicious, but I had some chocolate-tahini sauce I made the other week and I used that instead. I added a scoop of vanilla ice cream and some sliced bananas, just because. For the recipe, see Baking with Julia by Dorie Greenspan. There’s also a video of Norman and Julia making the beignets together. Don’t forget to check out the rest of the TWD Blogroll! 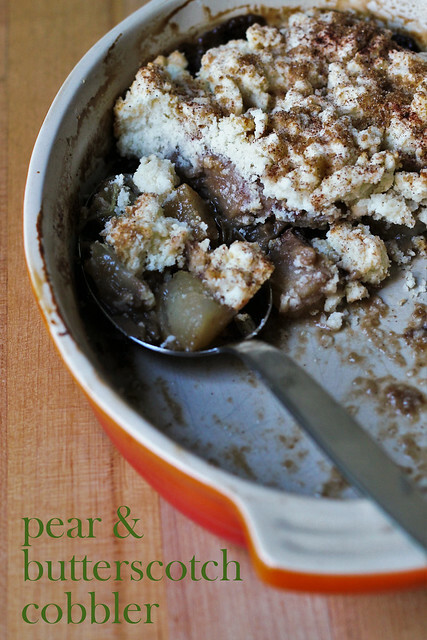 Pear and Butterscotch Cobbler and a BOOK GIVEAWAY! I’ve found that a lot of people shy away from making one type of dough or another. Some people claim, “Oh, I don’t do pie dough,” while others say, “I stay away from yeast.” When my friends at Quirk Books asked me if I wanted to help celebrate the release of their new book, Making Dough: Recipes and Ratios for Perfect Pastries by Russell van Kraayenburg, of course I jumped at the chance. Russell writes the gorgeous blog Chasing Delicious, and that guy can bake. His new book is full of tips and information to make a rainbow of doughs including: scone, biscuit, pie, shortcrust, sweetcrust, choux, brioche, puff, croissant, Danish and phyllo. Whatever your personal dough demon is, you can work through it with this book. Russell gives a master dough recipe for each type (which he explains by using easy ratios) and then several recipes using the various doughs. For me, biscuits were my dough nemesis until a few years ago, when I worked at a bakery and had to crank out trays of breakfast pastries every morning at 6 am. After all that practice, now I own those suckers! I was super pleased to give Russell’s biscuit dough a try as part of Quirk’s Biscuit Week Challenge. I spied a plum cobbler recipe in his book and couldn’t get the thought out of my head– sweet, soft fruit under a tender, cakey, slightly savory biscuit crust. When I remembered a few Bartlett pears and a bit of homemade butterscotch sauce in the fridge, a light blub went on in my head and I was inspired to make a Pear and Butterscotch Cobbler using up my odds and ends and Russell’s biscuit dough. He’s even put together a video to show step-by-step how to make perfect biscuits. Because the dough is dropped on the fruit here, instead of rolled and cut, a tender cobbler topping is almost guaranteed, even if you think you’re dough-challenged. The kind folks at Quirk Books sent me a copy of Making Dough, and now I want to send a copy to one of you! Just leave me a comment (one per person, please) on this post before 5:00 pm EST on Tuesday, November 17 and I’ll randomly choose a winner from the list. Be sure your e-mail address is correct so I can contact you if you’re chosen. Notes: If you don’t already have butterscotch sauce on hand, you can approximate the flavors here with 1/4 cup dark brown sugar, a pinch of salt and 1 tbsp of butter cut into little bits. Toss with the pears and other filling ingredients. – Position a rack in the middle of your oven and preheat oven to 400°F. – Turn the fruit mixture into a 1-quart baking dish and bake for 20 minutes. Remove from the oven and keep oven on. – Pinch off small handful-size clumps (about 2″ in diameter) of the prepared biscuit dough and scatter them on top of the filling so that the clumps touch. Be careful as your baking dish will be hot! – Lightly brush the biscuit clumps with melted butter (I dabbed with a pastry brush) and sprinkle with the 1 tbsp brown sugar and remaining 1/4 tsp cinnamon. – Bake for another 20 minutes, until the biscuits are golden and the filling is bubbly. Cool to warm or room temperature before serving. Please note that the publisher, Quirk Books, sent me a copy of this book. I love making pastries with choux paste. The dough is so fun to make, and then when you open the oven the oven and find a tray of chubby golden puffs, well, I think it’s just delightful. 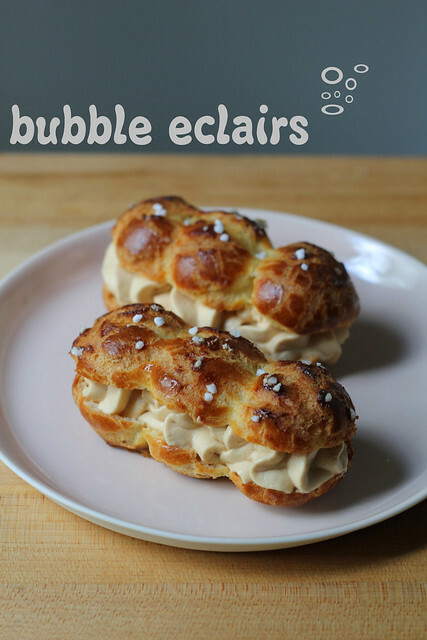 These Bubble Éclairs are like cream puffs piped (I used a pastry bag and tip rather than a cookie scoop or spoon) snuggled up together in éclair form. Cute! 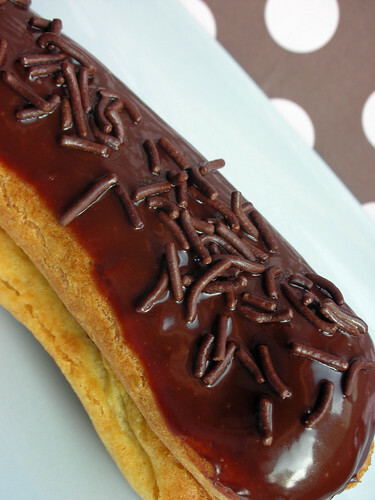 You can get fancy with these éclairs, or keep them simple like I did. I just sprinkled a little Swedish pearl sugar on the tops before baking and filled them with coffee whipped cream after (flavored with the espresso syrup I still have in the fridge from BWJ’s Cardinal Slice). I did make a couple of fancier ones with white chocolate glaze and passion fruit whipped cream, but it was such a hot, muggy day that they became a drippy mess when I tried to photo them. Whatever, you get the idea. 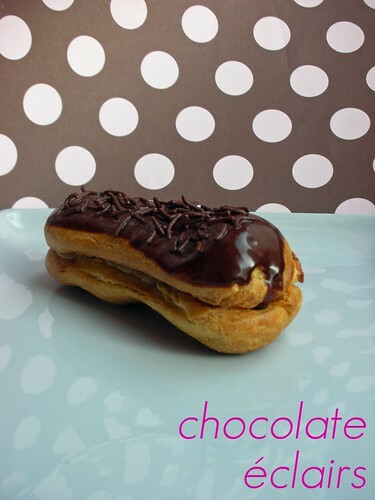 I sure wouldn’t mind an éclair served profiterole-style, with ice cream and chocolate sauce…next time. For the recipe, see Baking Chez Moi by Dorie Greenspan (it’s also here). Don’t forget to check out the rest of the TWD Blogroll! 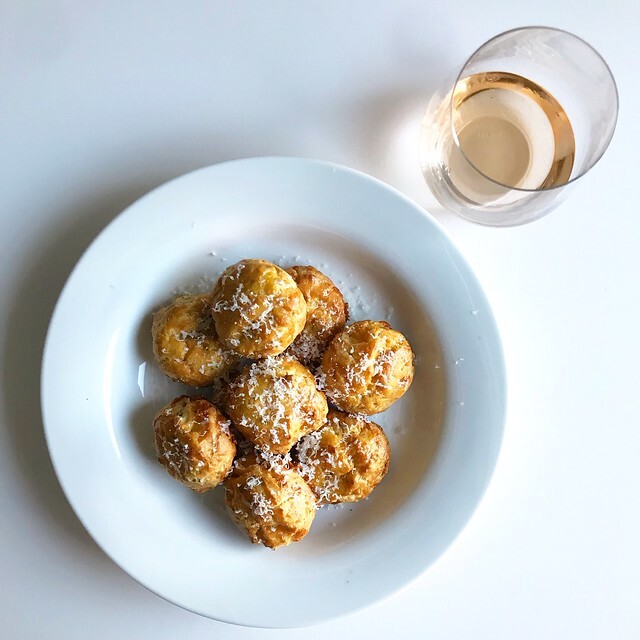 If you are looking for a little nibble for early evening rosé hour on the deck, might I suggest Norman Love’s Savory Puffs? 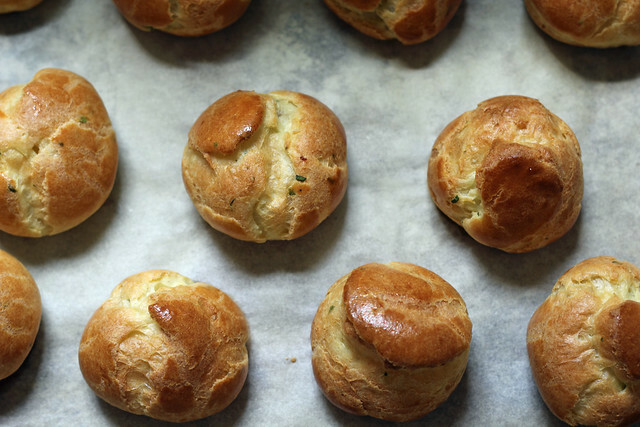 I love making pâte à choux— sweet or savory, I think it’s one of the most fun classics. This particular recipe is actually a little unusual…instead of just plain old water as the liquid ingredient in the dough, it uses cucumber and onion juice, along with a bit of milk. I made a reduced-size batch (I skipped the éclair version) so rather than actually juice the cuke and onion, I just grated some of each on a box grater, salted the mix lightly and left it to drain for a while over a sieve. Then I gave it a final squeeze, measured out the juice that drained off and used it in my choux paste. I set aside those shreds of veg in the sieve (now relieved of excess moisture) and used them in my puff filling. Waste not, want not– am I right? First I chopped them up a bit finer and then stirred them, along with some herbs and seasoning into a mild, soft cheese curd that I like called Cloumage. The smoked salmon version of the filling sounds delicious, but will have to wait for another rosé hour…perhaps next week, as I still have a few empty puffs in the freezer (and another bottle of rosé in the fridge). Want to come over? For the recipe, see Baking with Julia by Dorie Greenspan (there’s a a video here of Chef Norman making the puffs). Don’t forget to check out the rest of the TWD Blogroll! Choux paste treats have been well-covered here. Gougères, éclairs, cream puffs and even crullers–wait, something’s missing. 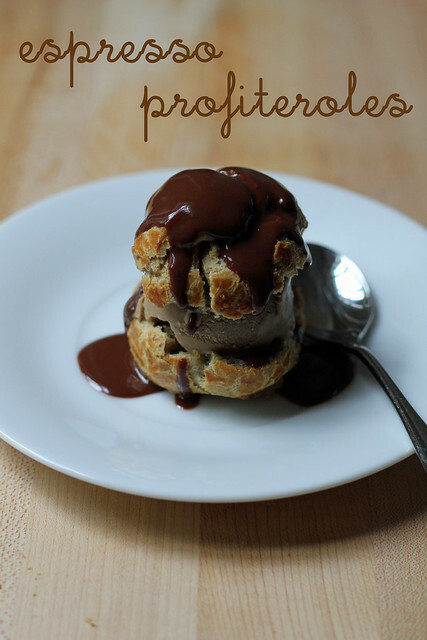 How could I forget profiteroles, one of my most favorite desserts? I’ll take care of that one now with Norman Love’s Espresso Profiteroles. Despite my love of profiteroles, I admit that I didn’t have high hopes for these. Quite frankly, I thought the picture in the book looked terrible (the choux looked bready, not light). I’m happy to report that they turned out better than expected. I’m not sure how much flavor was really contributed by adding coffee to the choux puffs themselves, but they puffed and hollowed nicely. I used espresso ice cream (instead of cinnamon) and boozed up the chocolate sauce with Kahlua (instead of Grand Marnier), so that took care of the missing coffee flavors. We’re going without hosts now for TWD, so for the recipe, see Baking with Julia by Dorie Greenspan. Don’t forget to check out the rest of the TWD Blogroll! Yeah, that’s right– a new Dorie book means a new group! Laurie started up French Fridays with Dorie (which, for some reason, I keep calling “French Fries with Dorie”), a weekly celebration of the recipes in Dorie Greenspan’s gorgeous new book Around my French Table. Things have been more than a little disorganized here…boxes are everywhere, butcher paper is tied and stacked like bales of hay, and the kitchen counter is pretty messy. I thought I might miss the first party, and have to skip making these gougères. Then I thought again, and realized I could really use a glass of wine and some snacks! 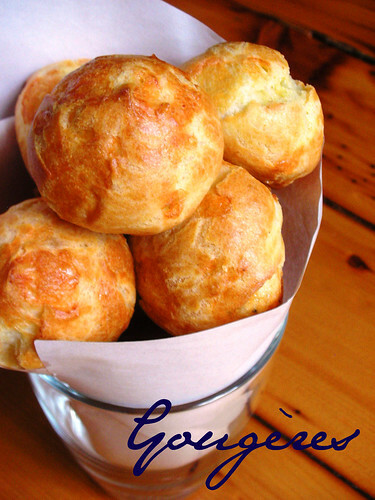 Gougères are little cheesey puffs made with a pâte à choux base. If you’ve never prepared choux paste before, it’s not hard (I even made this batch by hand), and in my opinion it’s one of the most fun things to make! I used gruyère cheese in mine, but you can use whatever grating cheese flots your boat. Salty and good! For the recipe, see Around my French Table by Dorie Greenspan. Don’t forget to check out my fellow francophiles’ posts! Éclairs may be my husband’s favorite pastry. He blames a box of éclairs that I made and brought home while in cooking school for sending him on a downward sweets spiral that resulted in him being on a diet for like two years after my graduation! I blame his lack of self-control. 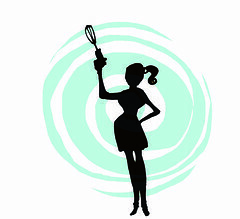 Let’s see if he can keep it together for this month’s Daring Bakers event– Meeta from What’s For Lunch, Honey? and Tony of Olive Juice have challenged us to make éclairs. Not just any éclairs, but Pierre Hermé’s éclairs. 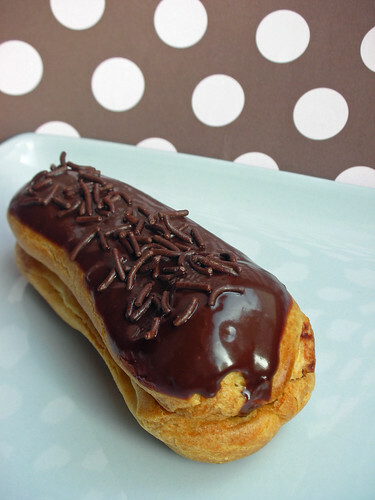 Éclairs are made from choux pastry, usually filled with pastry cream and dipped in chocolate. They’re just like a cream puff, but elongated instead of round. Meeta and Tony wanted us to keep either the glaze or the pastry cream chocolate, but gave us free reign to make one of them non-chocolate. I kept the chocolate on top and filled mine with a coffee-wattleseed pastry cream. It wasn’t until I took that top picture, that I noticed that from the side, my éclair looked a little weird. “What’s with this thing?” I thought. I usually prefer not to cut éclairs in half in order to fill them. Looks-wise, I like them better when they are kept intact and filled through a small hole in the back or on the bottom. But I was fast running out of daylight for my photos, so I figured I’d cut them in half to cool quicker and just assemble and photograph one right away. Upon closer inspection, I realized that rather than filling the bottom half of the éclair I photoed with pastry cream, I’d filled the top half of another one, and then sandwiched the two together. D’oh! I thought about a redo but then I decided to leave it, so you can have a glimpse of what it’s like to be me, the master (or mistress, I guess) of imperfection. I made Dorie’s pâte à choux not too long ago, and I think I preferred it. The ingredients aren’t too different, although this one from Hermé has an additional egg. Perhaps that’s why it seemd a little crustier than I’m used to. I also had to bake it a bit longer than the recommended 20 minutes to dry it out and get it the shade of brown I like. I do love the chocolate sauce, though. It is delicious, and luckily I have a bunch left over..it will be great on ice cream. Check out the DB blogroll! And visit Meeta or Tony for the recipe (which was adapted from Chocolate Desserts By Pierre Hermé).